Published: 2013-12-03, by Peter Warrior. "Control tower, do you read me?" Honestly, the first I do every time I review a flight simulator, no matter where it comes from, is to crash, the badlier the better, because there is where laws of physics must do their best. I can say in advance that planes in this game crash pretty well, especially when on sea. On land, physics work as they should, but you aren't delighted with the view of your plane in flames but a frozen screen and a sad message. Graphics are average, which is indeed something good because it means it can run on a lot of different devices. Regarding sound, yes, there's sound if that's what you were asking, and also an option to switch it off. Gameplay, which was why we came for, is shallow, to put it in a few words. It's closer to arcade than we would have liked, though there are some details that honor it. For example, landing gear is downed and raised accordingly, and you have to park your plane in a hangar or wherever. Missions are timed, so you'll have to struggle with the radar to get the maximum scores. In conclusion, any of the titles in VascoGames's Flight Simulator series are worthy of be given a go by any flight enthusiast, and even non usual players of the genre may like it. However, they might not be as demanding and realistic as you would like, being sophisticated casual games in the end. 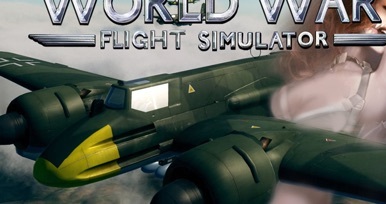 World war two flight simulator challenges pilots and aircrafts as never before, this World War Two 3D flight sim gives pilots the chance to show off their skills for the United states Army Air Force the USAAF. Before every rookie pilot can show what he is worth for his country he needs to complete a crush flying curse. So if you’re a long time ww2 flight simulator fan and eager to prove that you master the skill of flying. 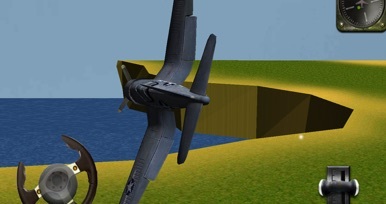 Then take off with this ww2 flight 3D training game. Taking off with one of the most popular fighter aircraft of the united states during the second world war takes loads of skill. Face down everything the ground crew of the flying school throw at you in this World War 2 3D flight simulator. This flight game is an essential flight-training game witch will push you and your aircraft to the limit. The Vought F4U Corsair was a carrier-capable fighter aircraft that served primarily in World War Two. 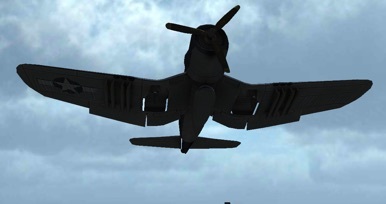 With outstanding aerodynamics the Corsair took advantage on most other naval fighters. The full flight training campaign mode takes you right in, keep your airplane in the sky. Fly the mission and successfully land your plane on the tarmac off the runway of the airport. This new flight simulator is hard for every rookie pilot, so start practicing your landing and take offs with your aircraft. Wait till air control gives you clearance to land or take off, learn the ropes of flying a real word war two fighter plane. Fly, land and park your plane safely, can you master this without crashing then you can call yourself a real ace of the sky’s. To be the most successful aeroplane pilot in the sky you need to follow the directions fro control closely. So you know what direction you need to go. -20 different airplane missions – landing , taking off, and more. -Change your view to Cockpit view . -Time challenge you you could enjoy the scenery of the sky around you but time is not on your side. Bring your aircraft down before time runs out! -Watch out for skyscrapers or else its mayday, mayday and that is not good for your flight career. -Different airports to land your aircraft and to take off from. -New aviation missions will follow. 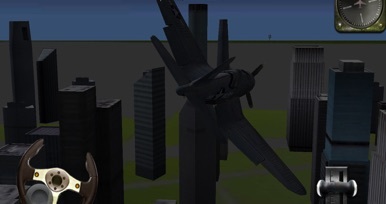 -New airplanes will be added. Mobile Flight Simulator. Honestly, the first I do every time I review a flight simulator, no matter where it comes from, is to crash, the badlier the better, because there is where laws of physics must do their best. I can say in advance that planes in this game crash pretty well, especially when on sea. On land, physics work as they should, but yo….